We invite you to learn more about our incredible year in 2016! Our 2016 Annual Report may be accessed here. The Foundation for Global Sports Development (GSD) is now accepting applications for their Exceptional Youth Scholarship Award, a scholarship created to support deserving youth as they further their educations and strengthen their futures. This is the third year GSD has offered this scholarship to high school seniors. Ten applicants who have demonstrated remarkable academic performance as well as a commitment to volunteerism and mentorship activities will be selected to receive a scholarship in the amount of $5,000 to be applied towards the cost of attending an accredited four-year college or university in the United States. Financial need will be taken into consideration. Applications for the scholarship award will be accepted April 26th through June 13th, and the winners will be announced by July 10, 2017. We have just returned from Calgary, Alberta where Classroom Champions hosted their 2017 Social Emotional Learning (SEL) Summit. Teachers, Classroom Champions staff, athlete mentors, board members, and donors all came together to share their experiences with the program. The summit also included several professional development workshops for the teachers. We have recently decided to partner with Classroom Champions with a grant of $50,000. So that we could learn more about the program, they invited us to join them for the four-day summit in Calgary. This summit allowed us to get to know the teachers, staff, and athlete mentors and also to gain a deeper understanding of the remarkable impact this program has on classrooms, families, and communities across North America. Monique Sullivan, an Olympian mentor from Canada, emphasized that she believes the athletes themselves get as much – if not more – out of Classroom Champions as the students. The teachers, on the other hand, were continually sharing moving stories of how the video sessions, lessons, challenges, and mentor relationship with the athletes have improved their students’ lives. To say we have come away inspired would be an understatement. Throughout the weekend, it became increasingly clear that each individual associated with Classroom Champions carries a deep commitment to its mission, and together they have a strong team. Classroom Champions is a non-profit organization that pairs Olympians and Paralympians with K-8 classrooms across North America. Their mission is to connect underserved students with world-class mentors, support teachers, and engage families so children can achieve a successful future. By using video technology, the athlete is able to interact with the students in monthly video lessons and video chats. The lesson topics include honesty, goal setting, perseverance, courage, healthy living, and more. Each month’s lesson includes a takeaway challenge for the students, resources for the teachers, and a newsletter for the students’ families. Classroom Champions President and co-founder, Steve Mesler, came up with the idea while talking to his sister about the potential an athlete mentorship program could have on classrooms in underserved communities. The organization’s first official school year was 2011-2012. Five Olympians and two Paralympians mentored 25 classrooms. Now, in the 2016-17 school year, they have 45 elite and college athlete mentors working with 200 classrooms and approximately 5,500-6,000 students. For the past four years, Classroom Champions has hosted an SEL Summit in Calgary, Alberta for the teachers participating in the Classroom Champions. This year 30 teachers from all over North America traveled to network, share their experiences with Classroom Champions, and attend professional development sessions. The weekend included a trip to Canada’s Sports Hall of Fame and Calgary’s Winter Sports Institute. Here we got a dose of sports history in the state-of-the-art museum and were able to watch as Canadian athletes trained. Our field trip was followed by a luncheon where Mesler and Heatherle Chambers, Senior Education Coordinator, shared with us Classroom Champions’ 2016-2017 recap. We enjoyed learning about their remarkable growth over the past couple of years and hearing their goals for the future. That evening we joined athlete mentors, board members, and donors for an evening dinner. The positive energy in the room was palpable as the different groups shared why Classroom Champions was impactful in their own lives. Teachers shared that now, for the first time ever, their students walked with their heads held a little higher and a look of pride on their faces. Students in younger grades were role modeling to older students what friendship, honesty, and teamwork meant. Each teacher was able to identify a clear and positive shift in his or her classroom. Saturday was filled with professional development opportunities for the teachers, including workshops on Growth Mindset, Trauma-Informed Learning, Social Emotional Learning, Student Voice, and a book club hosted by Classroom Champions staff. As the workshops ended and teachers shared their take-away moments, they echoed one another with the belief that ALL classrooms worldwide could benefit from Classroom Champions. The program inspires passion, change, cohesion among classrooms across the continent. Classroom Champions is on the forefront of incorporating mentorship education, specifically around the Olympic and Paralympic values, in classrooms across North America. 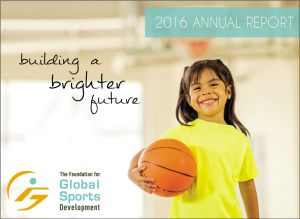 The Foundation for Global Sports Development is thrilled to be supporting such an energetic, young organization with such a strong network of likeminded individuals and organizations. Teens use their free time during Spring Break in many different ways – some go on vacation with family, many catch up on rest, some stay in town and work or get ahead on schoolwork, while others go on service trips with youth groups. For this year’s Spring Break, 29 youth and 7 adult mentors from Boys & Girls Clubs of Portland and Eugene attended our 2017 Playmakers Program for an immersive sport experience. Our Playmakers Program, which is designed to impart the Olympic and Paralympic values to young people, offers teens the opportunity to live, dine, and learn among some of the nation’s top athletes. Hosted by the United States Olympic Committee (USOC), this four-day program at the USOC’s Olympic Training Center in Colorado Springs pushes youth outside of their comfort zones and into new experiences. The youth are placed into smaller groups of 7-8 teens, accompanied by 1-2 adults, to facilitate teamwork, leadership, and sportsmanship skill building. 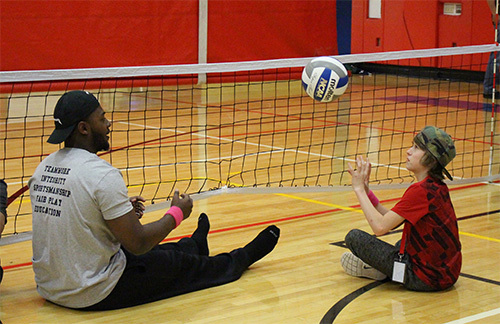 An adult mentor and youth practice sitting volleyball. Sitting Volleyball – Led by Brendan Ledwith, Coordinator for Sport Development for USA Volleyball, the youth learned about Paralympic and Sitting Volleyball history followed by a lively tournament between the small groups. Cycling – A highlight of this year’s program was a field trip to the Velodrome, the indoor racing track for USA Cycling. Simon Bennett, the National Team and Resident Program Coach for Team USA, reviewed safety and protocol of cycling in the velodrome – where the bikes have no brakes – before encouraging the youth and mentors to give the sport a try. Goalball – Participating in a sport for people with sight impairments was a challenge for many of the youth, but it was a challenge they welcomed and enjoyed! Kevin Brousard, the Membership and Outreach Coordinator for the United States Association of Blind Athletes, demonstrated the offensive and defensive techniques of Goalball and then encouraged the youth to play a few games on their own. Several teens commented that they were surprised how challenging the sport was and that it was an interesting change to rely so much on their listening skills. It brought their teamwork to a whole new level! Fencing – Lucas Scrimsher and Logan Storie, both Pentathlon Team USA members, taught the classic art of fencing to the youth. The teens were surprised to learn this seemingly simple sport was much more complex than it looks! 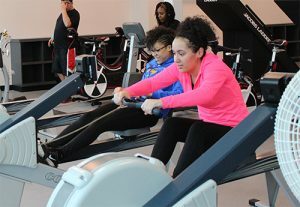 Two youth participants try the gym equipment. The USOC arranged a morning of breakout sessions and interactive workshops for the youth in the state-of-the-art Ted Stevens Sports Services Center. In the nutrition session, youth learned how to make quick and easy snacks, including a strawberry-banana smoothie. During the Conditioning and Peformance workshop, teens learned some of the resident athletes’ training techniques and were even able to use some of the gym equipment. With Sports Medicine and Sports Science, the youth learned about the incredible technologies available at the Olympic Training Center to help keep athletes healthy and competing at optimum levels. After visiting all of the sessions and understanding how many people and a LOT of time and effort contribute to an athlete’s success, it truly became clear that success does not happen overnight – an important lesson for any teen. An important aspect of our Playmakers Program is the opportunity for the youth to get to know athletes. While watching the Olympics or Paralympics on television or online, the athletes seem so distant and removed from everyday life, but meeting them in person and hearing their stories helps youth understand the struggles behind a champion’s success. This year we were joined by two of our Champion Ambassadors, Esther Lofgren and Candace Cable. Esther used a slideshow, video, and icebreaker to teach the youth a bit about her sport of rowing. Candace shared her story as a Paralympian and also explained the LA2024 bid to the youth, as she is Vice-Chair for the LA2024 Bid Committee. Roderick Sewell shows his running prosthetics and speaks with participants at the 2017 Playmakers Program. Several other speakers joined us as well. 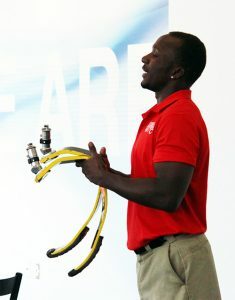 Roderick Sewell, a Para swimming champion who is an OTC resident athlete training for 2020, made quite an impression on the group of Playmakers. Many aspects of his story resonated with the teens, and his exuberant and warm personality made him feel like an instant friend to many of the youth. Needless to say, Roderick has a large group of new fans cheering him on as he trains. Haley Beranbaum, a Paralympic swimmer who competed at Rio in 2016, was there for our closing ceremonies and, together with Candace Cable, gifted the teens with a medal, commemorable pin from Sochi, and a certificate. Marcel Tirado, Chief Technical Officer for Around the Rings, incorporated some real life lessons for the youth by sharing the importance of being open to opportunities as they come and pursuing passions and interests. Our 2017 Playmakers Program is a result of incredible teamwork by several different groups. We want to extend a huge thank you to the mentors from the Boys & Girls Clubs of Portland and Eugene for their energy, awareness, and leadership in ensuring safe travels and an enjoyable time for the youth. All of our guest speakers and sport experience coaches went above and beyond to impart their wisdom – whether it be how to block the ball in Goalball or demonstrating the “power pose.” Of course, this program absolutely would not have been possible were it not for the superb staff at the USOC. We are grateful for the efforts of Chris Sullivan, the Chief of International Relations and Bids for the USOC, and the event manager, Chelsy Hodge, both of whom ensured this program would be a success. Now we begin planning for next year!